Here it is, as promised! 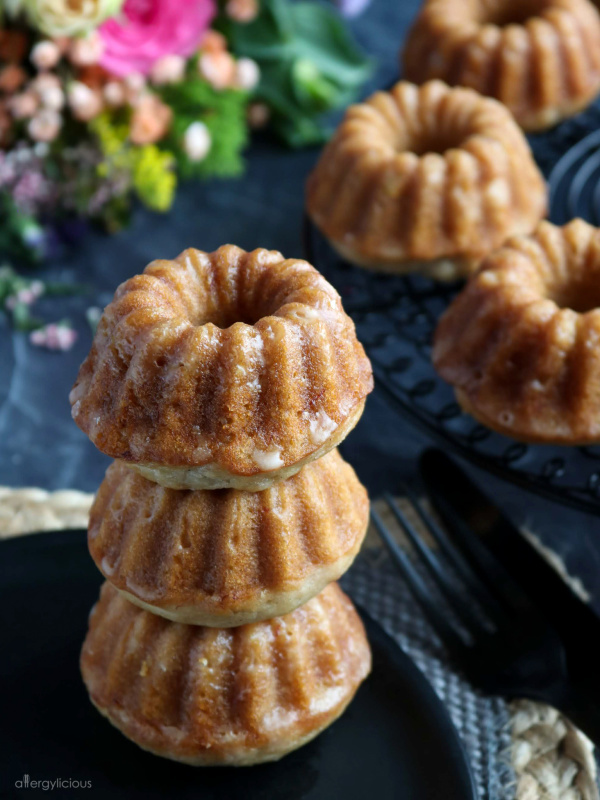 Mini Banana Bundt Cake, or what we like to call, Bundtini’s. 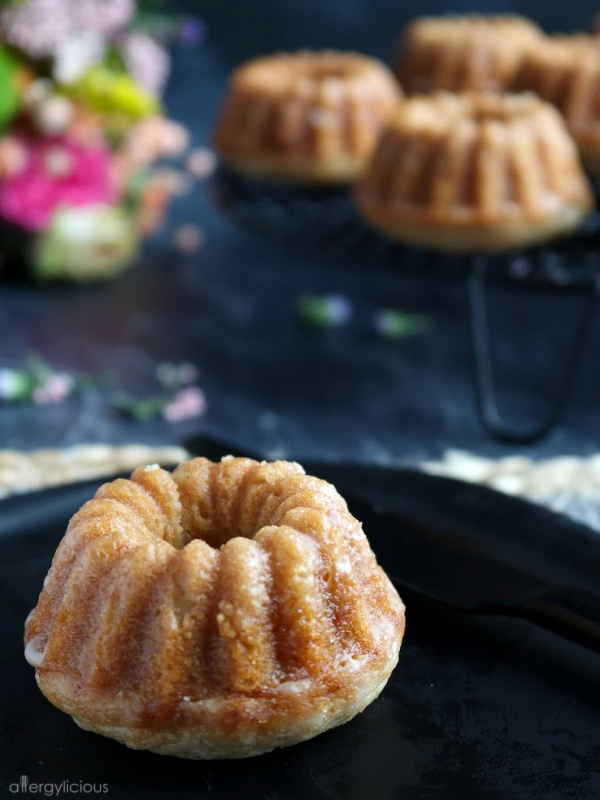 This banana bundt cake is fluffy, moist, tender and infused with banana flavor. It’s quite delicious on its own but I couldn’t resist topping it off with a light lemon glaze. You all know that I love donuts, right? Blackberry, Pumpkin, Chocolate, Cinnamon Sugar Sour Cream….just to name a few on the blog. 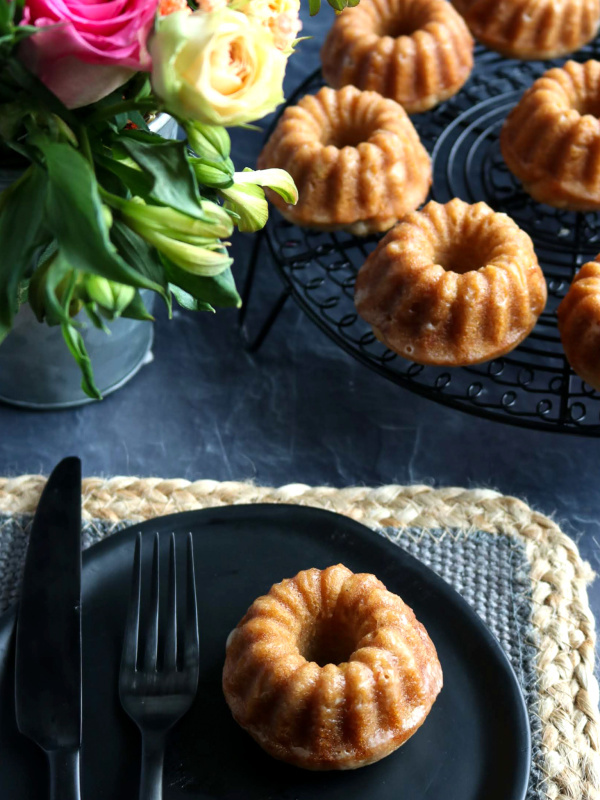 Well this bundt cake was originally going to be a donut, until this adorable mini bundt pan started calling out to me. Of course, I couldn’t deny such cuteness and decided to turn these banana donuts into banana bundt cakes. Because the star of this show is the cake itself, I wanted to top it off with something that was light and didn’t overpower. This lemony glaze was the perfect choice. It is refreshing, made with 2 ingredients and pairs beautifully with banana. But if you’re not a fan of lemon, my homemade cream cheese frosting is the BEST out there and tastes delicious on anything! That’s right, the other option is to drizzle these lovely vegan bundt cakes with my fav topping for a little more decadent, cake-y dessert. You can also substitute all-purpose flour for the baking blend if you don’t need this recipe to be gluten-free. It’s an easy swap and another reason why I like to use it on this blog. Did you ever hear the saying “Good things come in small packages”? Well that is so true! I seriously can’t even take how perfect this banana bundt cake is. 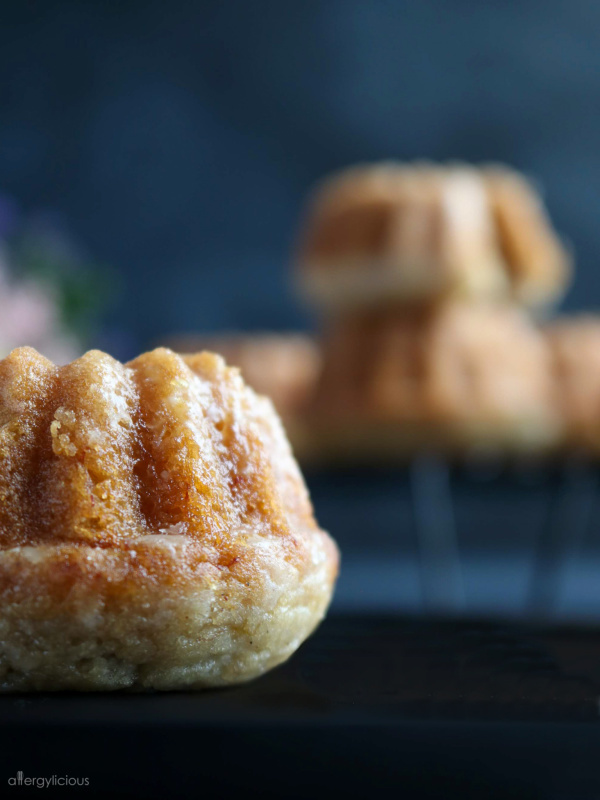 It’s the cutest little Banana Cake packed with flavor! Can you image serving these for Easter Brunch, Mother’s Day or if you’re like me, Girls Coffee. Really, this recipe may be your next excuse to host a little get-together. I can’t wait to hear how this banana bundt turns out for you! I hope it’s a big hit in your house. Please let me know how it turns out in the comments, and share a photo on Instagram with the hashtag #allergylicious. Craving more banana-flavored baked goods? Check out my Chocolate Chip Banana Bread, Banana Split Muffins, Blueberry Banana Cake, or Banana Bread French Toast. Sift dry ingredients together (flour, baking powder, baking soda, salt and sugar) in a large bowl. In a medium bowl, mash bananas well then blend together with coconut milk, agave, lemon juice, oil and vanilla. Pour into dry ingredients and mix just until combined. It may still be a little thick. Transfer batter to a piping bag or ziplock bag with the top cut off, and distribute evenly between molds., filling 3/4 full. Bake 12-15 minutes or until center comes out clean. Remove from oven and let cool on cooling rack. Make lemon glaze by sifting powdered sugar and adding in lemon juice, 1 tablespoon at a time until it forms a nice, spreadable glaze. *If you cannot do coconut milk, sub with another milk like flax, oat or almond milk. 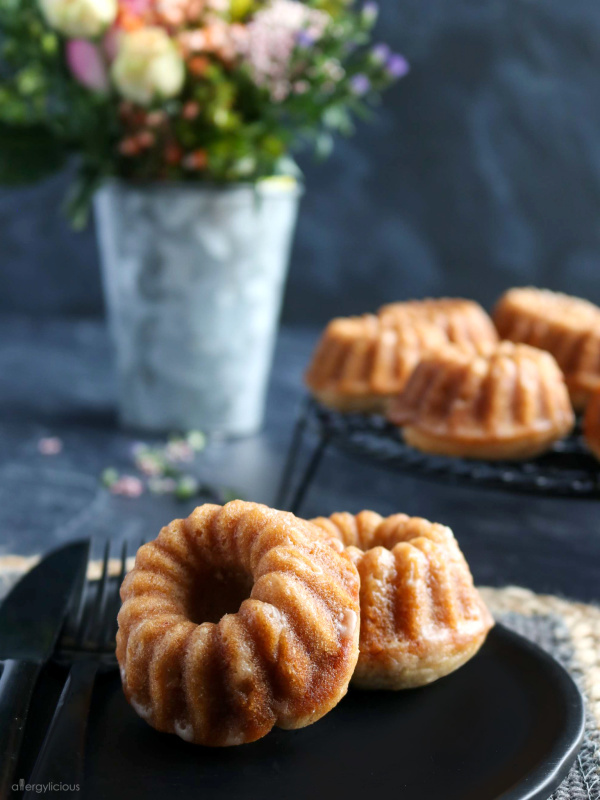 **Sub lemon glaze with vegan Cream Cheese Frosting for a more decadent bundt cake. 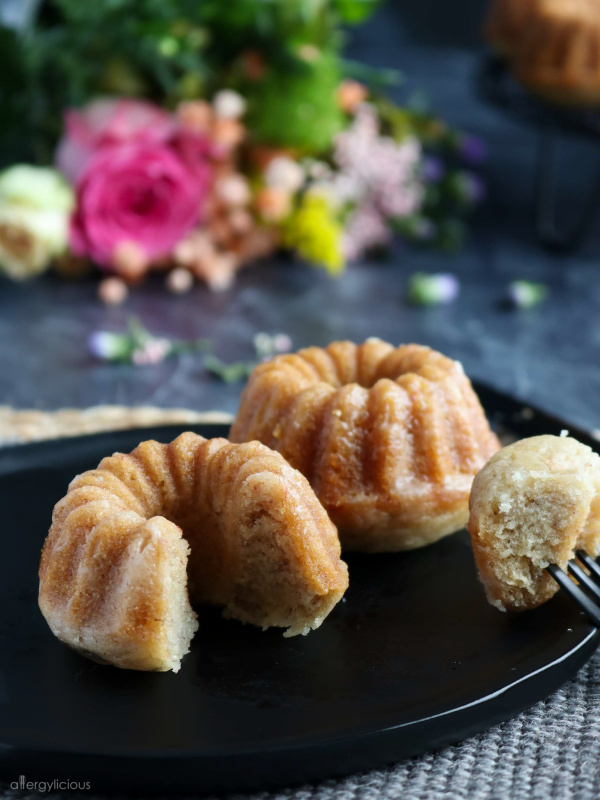 Mini bundt cakes are the absolute cutest! Love them! The recipe looks delicious and I can’t wait to give it a try. These are super cute and look so tasty! They’re perfect for Easter and Mother’s Day! Do you have a large bundt pan? You would have to increase the baking time. You could possibly also use muffin tins and just turn it into little muffins, baking for 12-18 min. I’d love to hear what you decided on!